Rebecca D. Nichols, O.D., specializes in comprehensive family eye care, including contact lenses and the diagnosis and management of eye diseases, with a special interest in pediatrics. Dr. Nichols received her undergraduate degree from the University of Kansas. 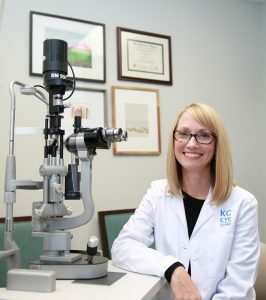 She graduated from optometry school at the Illinois College of Optometry in Chicago. Dr. Nichols has co-authored several presentations at national optometric conferences. Dr. Nichols sees patients in our office part-time and stays home with her 3 children the remainder of the time.